What would cause a rod to break like this? Topic: What would cause a rod to break like this? Had a Dobyns Savvy Mag Heavy that I used for light swimbaits. I purchased it refurbished late last year. I had a lure tied to it and put it in my car -- I have a Subaru Outback and put the rods in from the back, so they stretch out across the interior with as minimal bowing as possible during transport. 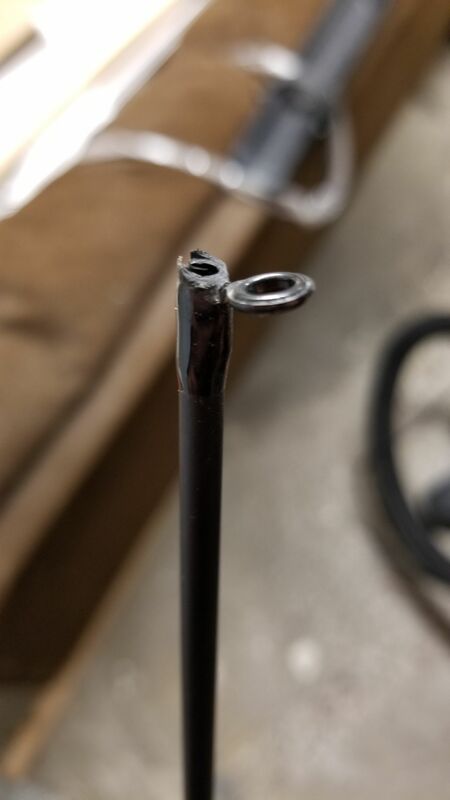 Went to get the rod out of my car and it was cleanly broken in the middle, right after the fifth guide. What could cause this to happen? 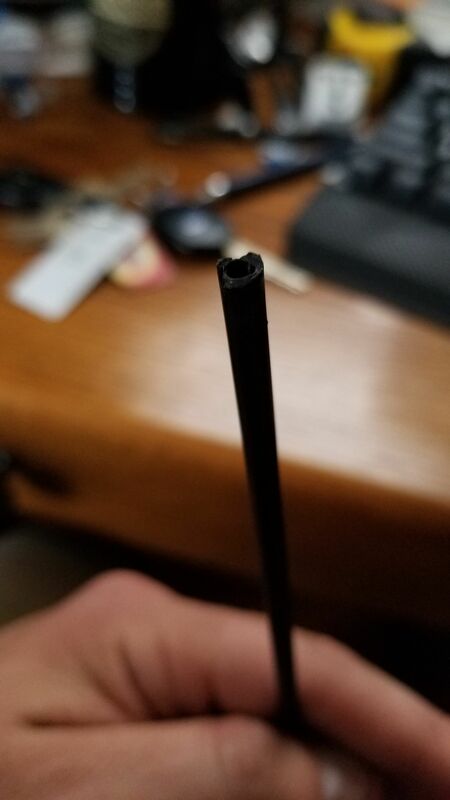 Re: What would cause a rod to break like this? The bow with pressure on the tip puts the blank into a strain that it's not designed to take, with that, one bump will cause damage and weakness, then at a point with the constant pressure upper end blanks will pop just like that. One of the very few issues with upper end blanks. So while I'm stuck bank fishing out of my car, I should lean toward cheaper graphite rods? Am I sentenced to Lightning Rods and Ugly Stiks, or is even a step down, like the Dobyns Colt or Fury series, less likely to experience that type of failure? Cant really tell from that pic. Can you take a picture of the bottom side and of the other piece? Not necessarily but it would be safer. Make sure to remove lures for transport. It safe for the rod and your vehicle's upholstery. It would also be best to get a piece of PVC that you can slide your rods into during transport. I know it seems like a lot of work and it will add ten minutes at each end of your trip but your equipment will appreciate it. It broke 20 3/4" from the tip. Do you tend to high stick when landing fish? The break is so clean it's kinda tripping me out. My initial thought is the blank may have been flexed too much, in which case you can get clean(ish) breaks near the guides (as guides dont flex, right around them is the higher stress points). But at least in my experience, those kind of breaks *typically* happen just BELOW the guide. If you want, I can post the photos to a private rod builders community and see what they say. Never actually caught a fish with that rod. Fishing started late in NY due to a cold April and they haven't been biting swim baits. And I don't keep a lot of tension on rod with the lure attached. Just enough to take the slack out of the line. Well, just for information sake. I carry a MINUIM of 5 rods in my car ALL SEASON LONG. Now, I make sure that the tip has ABSOLUTLY NO pressure at it, actually after setting in car , wrapped and ready to, I'll release, ever so 'slightly' the drag on crankbait rods and a counter twist on the spool og a spinning setup. I carry (changes often because I have to many , and I fish so many different BOWs with different wishes and wants for setups needed/wanted. I have/carry what many would maybe 'call' upper end rods, Steez , Loomis GLXs, Croix Legends, Avids and SCIII customs to name a few. These rods are carried now in a Malibu but always in similar size cars with rear pass through seating and front passanger seat able to fold flat. My rods reach from the trunk rear all the way to past from folded down front seat. I have NEVER lost a rod to breakage eithier while in the car NOR while fishing them. And YES I carry my Phenix Custom in the car too and MY RODS get used HARD. Maybe it was a fluke, maybe you had to much pressure on the blank (rod bend when you have the lure rigged and reell tightened so a 'bow is created in the rod'....I really can't tell you? ?? All I can do is share what I do and the lack of challenges I've had. Just did the math, I've been carrying rods 'full time' in a car for OVER 25 years now.......boy time flys. Oh, and I should maybe add another small fact, I had 5 rods that I still currently get action yearly and WERE being transported were involved in a Blazer multi roll over accident on the interstate. Rolled total of 6 times through the Median and I had a Rod bunk, cheap interior roof hanging deally, holding the rods over head AND ALL 5 RODS STILL SEE MUCHO YEARLY ACTION and still see a lot of in car transport. Again, just sharing, not recommending nor suggesting anything! I also carry all of my rods in my jeep ready to go. Never had an issue and wouldn't tell my customers not to do it either. I dont think that's the issue. It would be interesting to see what the blank looks like under that guide wrap. Think it's possible to make a warranty claim on this with the $60+shipping replacement cost? Hard to say what happened. Direct down pressure on a blank is never good. This is why many guys break rods between the tip and first guide while pushing down on a snagged bait. Regardless all of our rods are warrantied for no hassle, re-furbed or new. THX!! I'd say it's very likely possible. Give it a shot, they have great customer service.